The main prupose of creating it was that I have never been able to model a face. So I thought that some simple creature (like a butterfly) would have much less things that make modeling difficult. Like legs or hands or tails, for example. I guess that this is a WIP now. C&C more than welcome! Especially the C.
Right now, i’m texturing him. MtheGreat, your butterflys face looks good, but the render has no direct light hitting any part of the face. Try changing your light setup to accent the butterflys features, and I think you will like the result. Same comment about the light. It’s reminiscent of ‘A bug’s life’ that I just saw (for the xth time) yesterday. …, but the render has no direct light hitting any part of the face. now that you mentioned it, i noticed that as well. Update done. What do you think, does it still need tweaking? Btw, why do the images look worse than they really are, in the post? One thing I learned when modeling a butterfly is that the wing textures are really important. Try looking up some pictures online, a good texture would spiff things up immensely. On the other hand, if the texture is too good, it will detract from the cartoony look, so use your judgement there. I tried to texture the wings, but this is a pain in the a*s. Question: how can I do some precise texturing? Because, as far as my drawing skills go, I am not able to do exactly what I want just with the mouse brush thingy. You should get paintshop pro or photoshop. Those are great painting softwares. 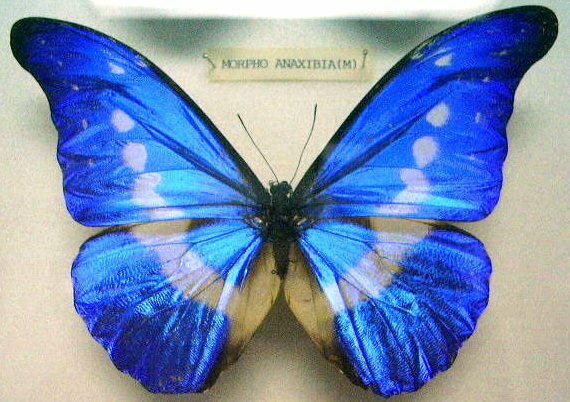 You should also UV unwrap the wings then export the unwrapped image and edit it in a painting software. that will give you some good dimentions to work with. Plus when you apply the texture all that you will have to do is apply the texture to the UV cordinates. Here’s an overview of how to apply the attached texture. There are lots of UV mapping tutorials, I’d suggest doing one to become farmiliar with the process. UV mapping is a very powerful way to make your models look really good. Also, I use the Gimp for image editing, mostly because it’s free. Select the wings, go into “UV Face Select” mode, align the view so you are facing the wings, hit “U” and a menu will show up. Use “Project from view”. Attached is an image I got off of Wikipedia. Create an image texture and apply it to the wings with the maping mode set to “UV” Change a window to “UV/Image editor” and you should see the shape of the wing uv positioning. In the menu on the header select the texture of the butterfly wings, it should show up behind the uv layout. Align the wing uv positions with the image, it won’t change the geometric shape of the wings. When you render now the texture should be mapped on to the wings! You can use a colorband to change the color, or alter the texture in an image editor. I guess I didn’t make myself quite clear. So, imagine I have my butterfly and 2 viewports, a 3D and an UV editor one. Now I select just the left wing, for example, and switch to UV Face Select mode. I unwrap using smart projection or whatever is best for it and create a new image in the UV image editor window. Now I go to Texture Paint mode. Everything perfect at the moment, right? So, I can now paint with my mouse either on the UV image or the model itself. Now, if I design the left wing, I can just apply the same image to the right wing to make the butterfly symmetrical. No problem with that. But, the method itself - painting with the mouse - is driving me crazy. I mean, even MS Paint is more accurate. Well, then why don’t I just edit the image in MS paint? Or Photoshop or Corel, perhaps? And to the real problem now - because the whitish lines in the UV editor that show me on which faces I draw will disappear. I’ll get just the blank black image and I won’t have an idea where this or that circle is going to. Is there any way to get these lines to an outside editor - or some better drawing features to Blender? Thanks in advance. Dudecon - the shortest and the best UV tutorial I’ve seen so far (obviously, I haven’t seen very much), big thanks and I learned how to stick foreign images on meshes. But since Bruce is rather cartoonish and I’m rather creative, I’d rather (ehh, I gotta find a synonym) paint his wings on my own. Any ideas on better UV drawing methods I mentioned above? Man, I talk too much. You could try finding a painting application that has layers support. Like the free Paint.NET. I’m not too sure whether GIMP has it too. Anyway, by putting the UV image exported from Blender into an external image editor, onto a layer with 50% opacity, you can paint on another layer and still be able to see the UV face lines. What did you mean by “exported from Blender”? The Dump Subwindow thingy or the actual image created in the UV editor? In the UV image editor, go to the UVs pop up menu, go to the scripts bar and select export image. There should be some options that come up but I think that you’re smart enought to figure them out. look in the 1st post, I made a basic blurred pixelated kinda plain texture. Not even good, but better than Stucci. Anyway, it appears that no matter how high-res my UV images are, they’ll still look cheap on Bruce. So is it possible to apply a 2D vector graphic (you know, the one that you can zoom endlessly) to 3D models in blender? Or do something that would deal with the sharp pixelated edges problem? I think your mesh needs a bit more working on; eg. to make it a little bit sharper around the edges. That way when your texture is pasted on it looks a little more convincing.